Federal policy defines “Hispanic” not as a race, but as an ethnicity. And it prescribes that Hispanics can in fact be of any race. But these census findings suggest that standard U.S. racial categories might either be confusing or not provide relevant options for Hispanics to describe their racial identity. They also raise an important question long pondered by social scientists and policymakers: Do Hispanics consider their Hispanic background to be part of their racial background, their ethnic background or both? A new Pew Research Center survey of multiracial Americans finds that, for two-thirds of Hispanics, their Hispanic background is a part of their racial background – not something separate. This suggests that Hispanics have a unique view of race that doesn’t necessarily fit within the official U.S. definitions. 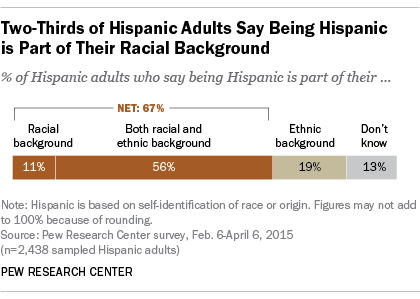 This distinctive view of race is consistent across demographic subgroups of Latino adults. For example, 69% of young Latino adults ages 18 to 29 say their Latino background is part of their racial background, as does a similar share of those in other age groups, including those 65 and older. Similar views are held among Hispanics who use Spanish as their main language (67%) and those who use English as their main language (66%). This finding sheds light on some of the challenges the Census Bureau has faced in asking Hispanics about their ethnic and racial background in surveys. Since 1980, the Census Bureau has asked everyone in the U.S. about their Hispanic origin separately from their race, and since 2000 it has allowed people to select more than one race in addition to their Hispanic background. But attempts by the Census Bureau to reduce the use of the “some other race” category in the 2010 census by adding a note on the questionnaire explicitly stating that “Hispanic origins are not races” had limited impact. That year, 37% of Hispanic respondents selected “some other race,” not much smaller than the 42% who said the same in 2000. To address these challenges in preparation for the 2020 decennial census, the Census Bureau is considering asking everyone living in the U.S. about their race or origin in a combined question. In other words, the form would ask people to identify their race or origin and would include Hispanic along with black, white, Asian, American Indian and Pacific Islander. Preliminary results from some experiments using the combined question show that when Hispanic origin is integrated into the race question, a large majority of Latinos (81% on average) mark just the Hispanic box and no other race category. As the total number U.S. Hispanics has rapidly increased in the last few decades, the Census Bureau has been under pressure to accurately measure racial identity of Hispanics. For example, race and Hispanic origin are used in the enforcement of Equal Employment Opportunity and other anti-discrimination laws. At 54 million, Hispanics make up 17% of the nation’s population, and they are projected to grow to be 29% of the U.S. population by 2060, according to the Census Bureau. Between 1990 and 2013, the nation’s Hispanic population grew faster than any other racial or ethnic group.